To me, there is nothing better than a good old fashioned country style home. It feels livable and relaxed and is very unpretentious. 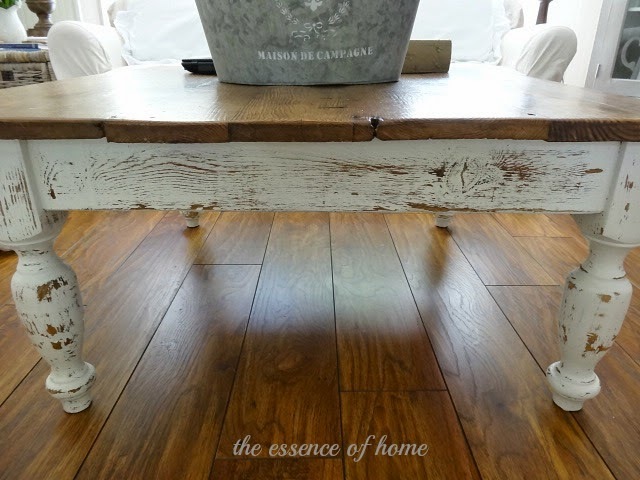 I try to bring elements into my home that give it that country relaxed feeling that I like. One way to do that is to not use too many things in my home that don't serve a purpose. In other words, they could serve double duty in some ways. I make functional items become decorative accessories. I don't have a lot of knick knacks around my house because of that reason. Who needs a vase for flowers? I used this pitcher instead. I hung these coffee cups off my bottle tree. It keeps them on display until I use them. I took the doors off a set of cabinets so I could display my everyday dishes. They're all white and are not only useful but pretty to look at. I use this wire basket to hold books or magazines. Why buy a specific magazine rack when a simple basket will do the trick? 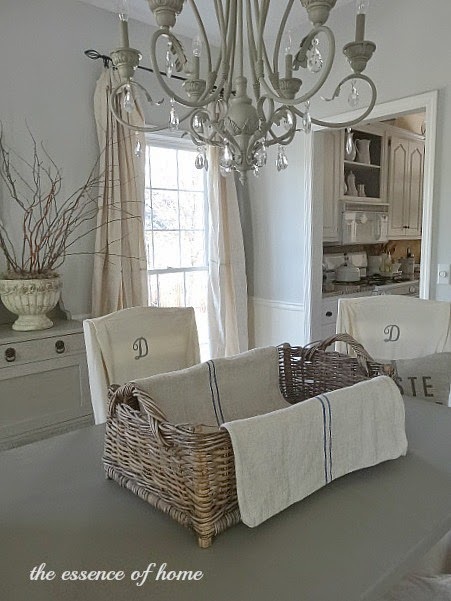 I used this over sized basket in the center of my dining table. You don't always have to have a fancy flower arrangement in the center. 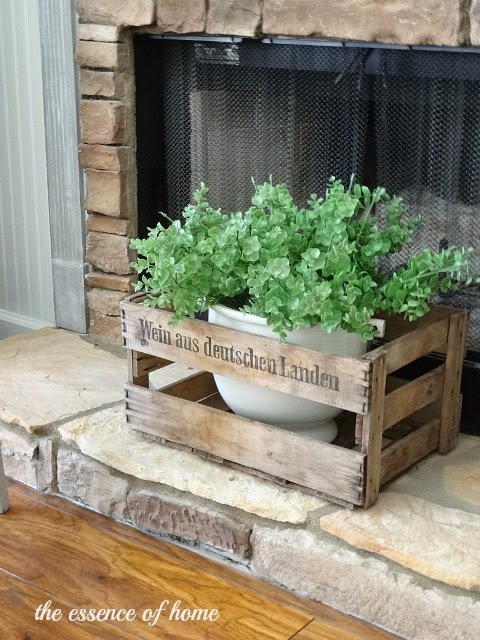 I'm using this old crate to give more personality to this plant on my fireplace hearth. Some things just need to be added as a "signature country look". These are a few that I've added to my home. 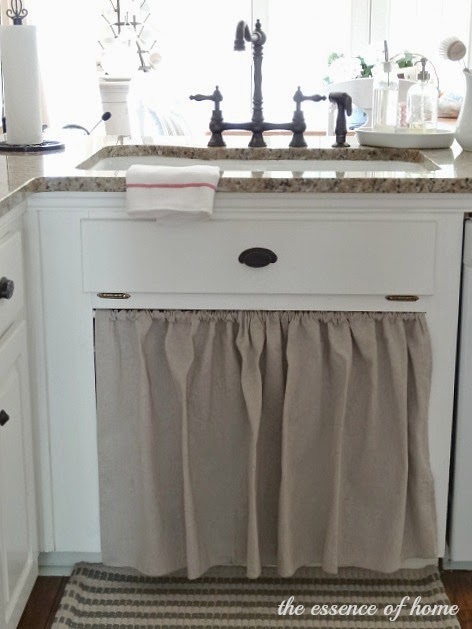 I made this skirt to hang in place of ordinary cabinet doors under my sink. 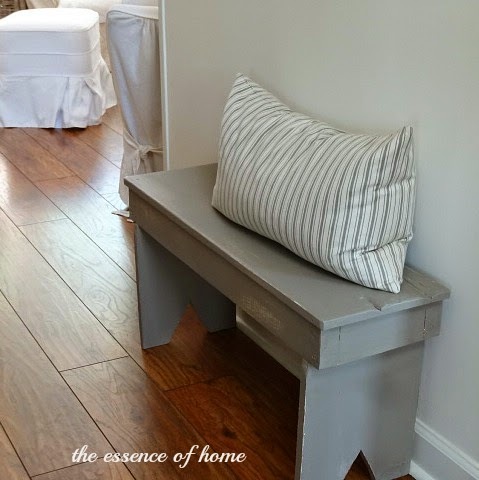 I placed this cobbler bench in my foyer. 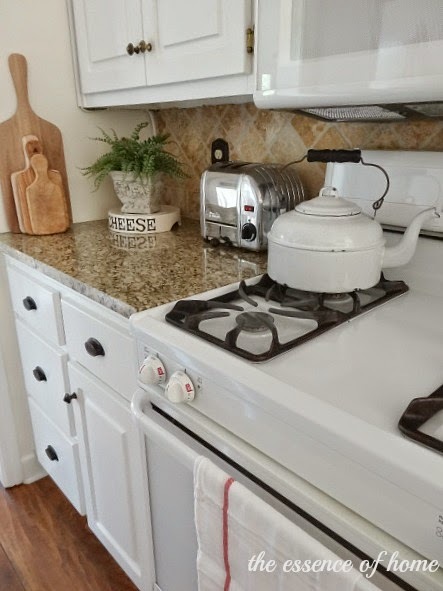 This vintage enamelware tea kettle replaced a newer modern one. Who says that all chest of drawers should only be used in bedrooms? I use this one in my sitting room. It has a country look and gives me more storage. This is an old rake that is no longer relegated to the outdoors. 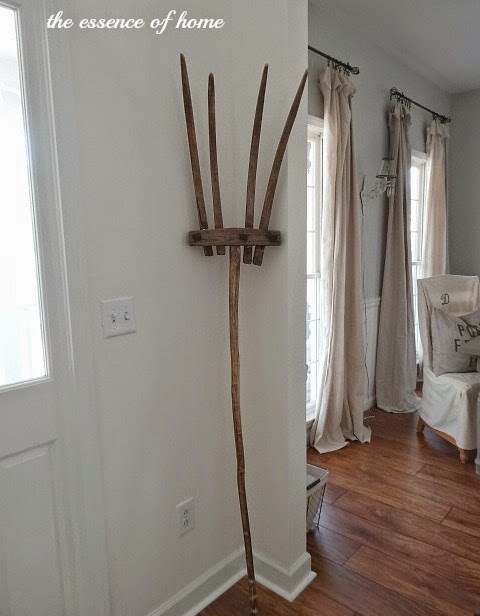 It is propped up as a country accent in my foyer. What to do with leftover old rope? 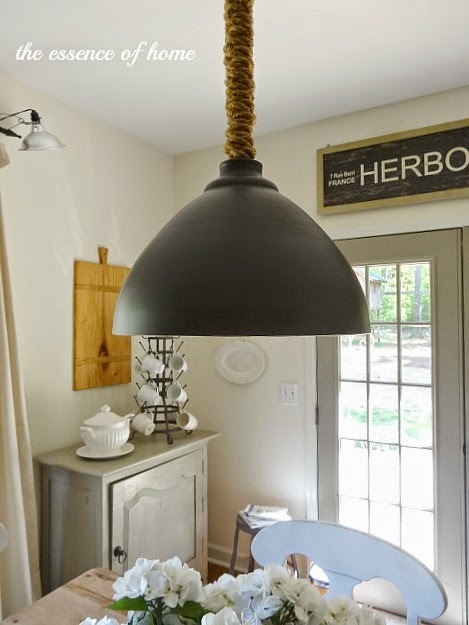 Why wrap it around your light fixture chain, of course! And finally, simple fabric patterns are used, such as these striped pillows. So, now you know what kinds of things I look for to create the country look in my home. Do you like the look of a country home? What elements do you use? Your country style is spot on. I always looking at your fresh design. My favorite post today!!! I love all of your storage ideas. Especially the baskets. Everything looks so pretty Kelly! I wish my house was as clean as yours looks. Hope you have a great weekend! I love the look of a country styled home Kelly and yours is spot on!! Kelly, I really love the casual country look you have created. It is a breath of fresh air! Every time I see your home, I am in awe of how simple, yet awesome your style is. I have the book Shade of Country, but it is not out on display because it doesn't fit my palette. But, it is the perfect book for your basket. Enjoy a lovely weekend in your little piece of country. To me country home evoke such comfort. Luv the inspiration Kelly. 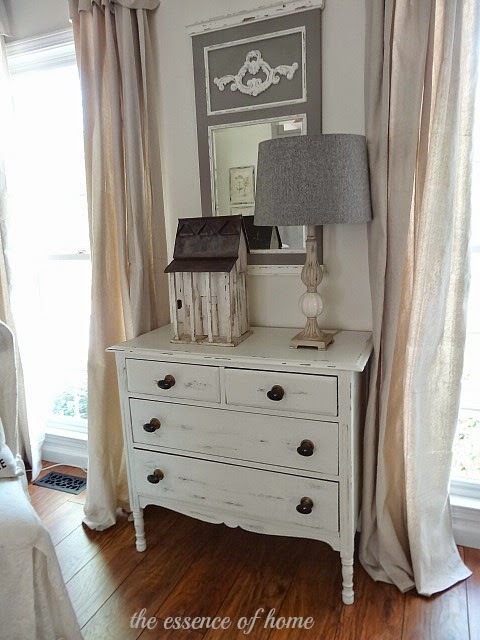 Now you have me adding a small chest on my list.I can use one of those 8n my sitting room as well. Very nice post.. enjoyed this Kim! My very favorite thing (and you have a lot) is the crate with the plant in it by the fireplace. Was that decor steals? 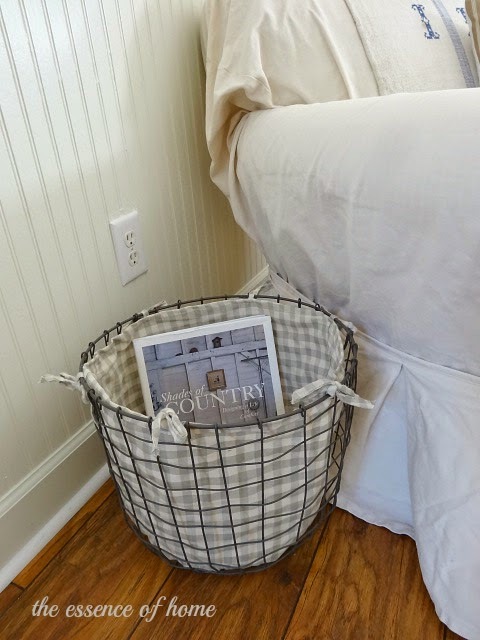 The perfect post/tutorial for creating the country look...you make it look oh so easy...I love your country touches and vignettes!! Oh I love it all, your home is so gorgeous and so inviting. Beautifully decorated. 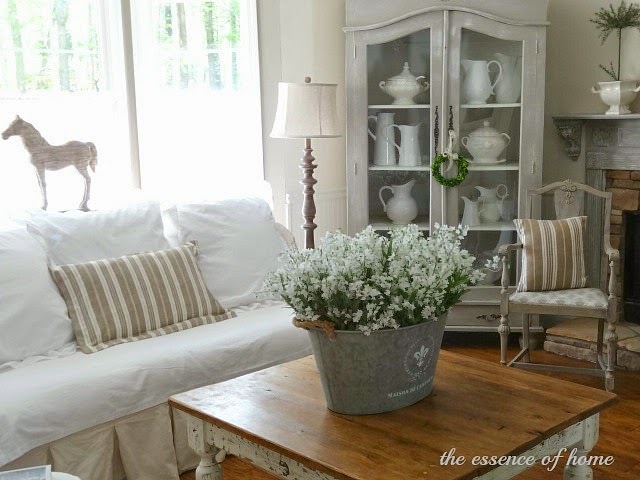 I love the look of a country home and yours is just perfection! I totally agree on using a chest of drawers in places other than the bedroom. They have so much extra storage. Love the enamelware tea kettle too! Very nice post, I love the plant in the wooden box. 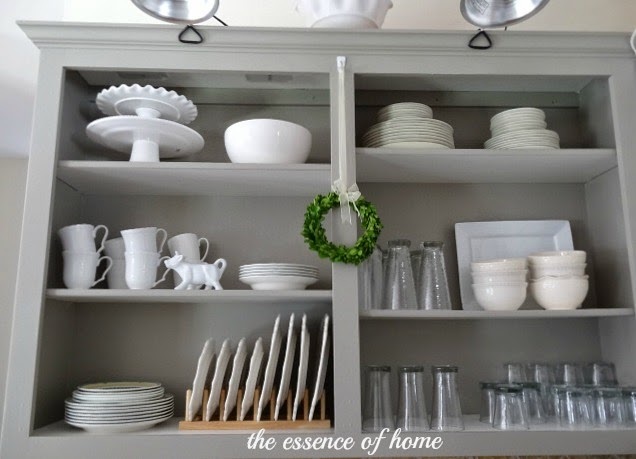 I have an old dresser in my dining room that holds extra dishes and linen napkins. Love everything you featured. Lovely country touches, simplicity at its best! Kelly...I love all of your country touches!! I'm trying to get a more simple country look and have been trying to get rid of some stuff. Two words....Eye Candy! :) You and I think a lot alike when it comes to practical and livable country style. 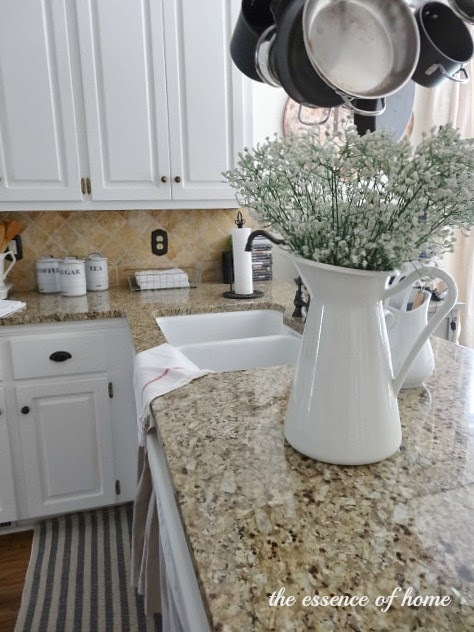 Your counter tops in your kitchen are really pretty. Love this Kelly, very inspirational, has me thinking how to bring such a look to my home. Great post. Love all the ideas of using what we have to do double duty. Your décor is so soothing, just the way I would love my home to look. Thank you so very much for sharing. Simple and great ideas. Loved that enamelware tea kettle and the striped pillow cover. I love all your country touches. It has been my fall back look for over 30 years. I love the crate on the hearth. I always love your style and I love that you use things that are not necessarily purposed for just one use. Ohhhh I love that tea kettle too. That is awesome. Oh Kelley - it's so beautiful! It's sweetly country, but has a hint of French personality, too. 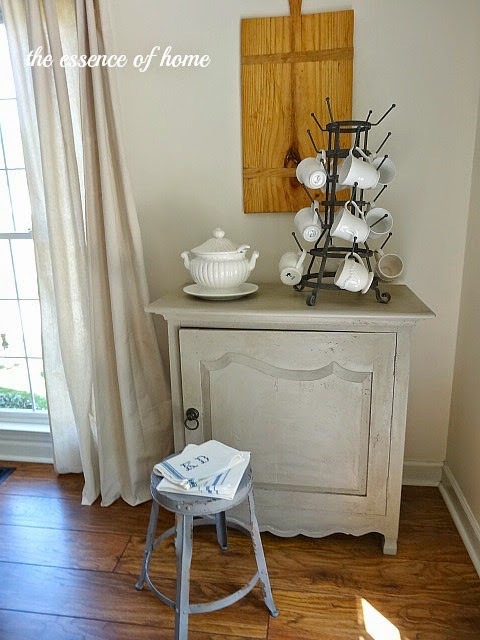 :) I love using rustic items mixed in with my shabby chic treasures. I think it grounds a space and gives it so much character. I LOVE your style!!!!! Thanks for sharing!!! I just love to decorate with anything vintage. Your home is beautiful and has so many neat country things. Love it! A beautiful place to visit this fine Sunday, loving your sense of calm. Your tea pot is so sweetly inviting me to stay awhile having a cup of tea with you! Will go catch up on some more inspiring beauty here that I may have missed out on. I LOVE love LOVE it ALL!!! I so want to walk through the house with a cup of coffee and chat about each room!! 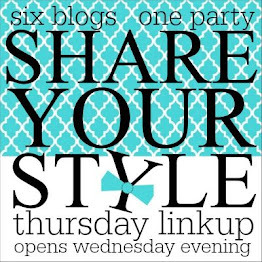 Love your home, your style, love YOU, my sweet blogger friend!! I really love your house. The "feel" is cozy and relaxed for sure. Kelly I love your home! And I'm with you - why use something intended for a certain purpose when something else is so much cuter?! Love the basket for magazines and pitchers are my fav for flowers - is that on from IKEA? i've looked at the one there so many times - need to break down and get one next time I'm there. I love the look of a country home -- even though mine is traditional. I think what I love best about your house is that you use unexpected things - like the rake, and the chest in the sitting room. It creates so much interest!